This entry was posted in Quilt kit, Quilt Pattern, Quilting, Quilts & Projects: Published, Quilts: Pieced and tagged Flying Geese, Fons & Porter Quilting Quickly November/December 2015, Katherine Ann by Patrick Lose Studio, Precuts Quilt, RJR Fabrics, Wendy Sheppard Designs. Bookmark the permalink. I love fabrics with antique colors such as muted blues, pinks and creams to make the quilt look timeless. Love your blog posts!! Beautiful quilts. Stay warm and safe during this cold period and pending storm. I’m sending positive thoughts and wishes for warm weather your way. I enjoy all reproduction fabrics. I am attracted to florals but am easily distracted by so much more. I love florals and dots, but recently purchased a pretty leaf design and I have no idea how I will use it! I am drawn to floral fabrics but have been known to buy other types of fabrics too!! Floral Designs are usually my favorite fabric theme is. Yet, recently we found out that my Niece is going to have a little girl. It is the first baby in our family in about 21 years, so I am going crazy with anything girly/baby print right now and most likely for awhile. I am the only one in our family that sews or quilts so I get to have all sorts of fun!! Thank you for sharing and just a note of encouragement it may take a tad bit, but you will get everything caught up and running on time again. I always enjoy your posts; have a fantastic creative day! Wendy, I absolutely love your posts and I often go back and reread them. 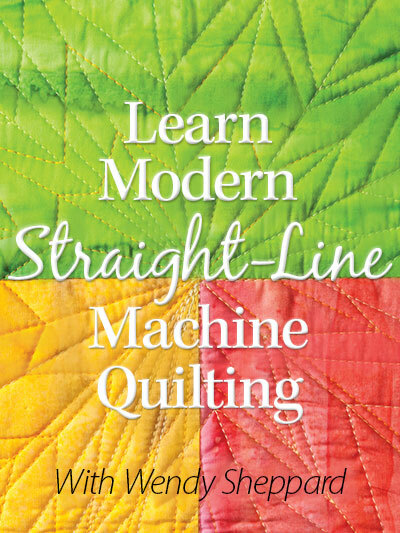 I also enjoy the pictures you post of the machine quilting. You inspire me! And, my go to fabrics are florals! I hope you survive the storm – stay inside under a quilt! Hard to pick a favorite fabric – hand dyes I’d say. HELLO,it is Florals; but I like to do Charity Baby Quilts, so i select many Children’s prints too. Thanks to You+RJR for a grand giveaway! This is a very hard decision for me to make but I would have to say that nature and florals depicted on a batik fabric is my downfall, however, with other cottons it is florals. I love a fabric line that includes text or script. I’m also always drawn to an Americana theme! I like to try and match the quilt style, colors etc. to the person for whom I am making the quilt. For boys its usually geometric patterns, solids etc. Almost all fabrics seem to fit for a girls quilt but the final choices really depend on whether it’s a ‘girly girl or more on the Tom boy side. It’s a challenge but makes it all very fun. I’m happy to play with almost anything, but find I am happiest with CW repros. I don’t really care for “theme” fabrics that are large and dominate a quilt. I prefer a range of textures and patterns, colors that work well together but aren’t too blended. Themes are okay, but I prefer them to be subtle, so that the texture/pattern is the dominant impression. And I love Christmas. I used to always look at mainly floral patterned fabric but now am leaning more to the plain or more modern themed fabrics. I love all fabric truthfully. I don’t know that “tone-on-tone” is a theme, exactly, but I tend to like small prints or nearly-solids. Congratulations on all of your publication…it is inspiring. I love reproduction fabrics, small prints and tone-on-tone backgrounds, as I rarely use solids. I love modern novelty and blenders. I am drawn to floral patterns, they bring thoughts of beautiful gardens and cheerful colors. I am on a batik phase at the moment. Working on a Labyrinth quilt right now. As always, busy lady. Love the “Dove” note from your husband……. Fun colors, fun fabrics in both quilts. However, I tend to be a floral person. Stay inside, all cozy and warm. We are damp and cold here in Middle TN, rain expected tonight. Then the big storm is likely to hit. Florals, geometrics. Paisleys. If I’m doing it for a specific person, fabric to suit the personality. We now have options for everything! Florals and geometrics. 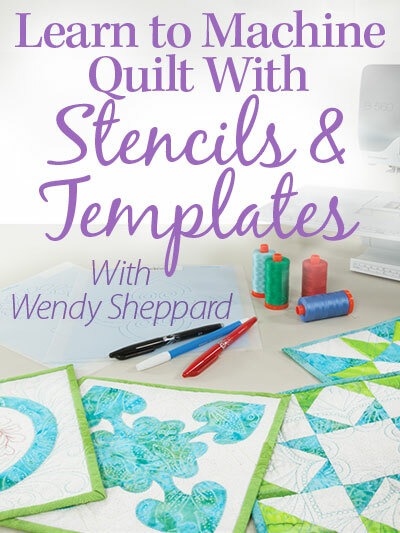 Lots more options now than 40 years ago when I had more time for quilting. I enjoy your blog. I’ve been tending to choose fabrics more on color lately. I love the happy colors in this quilt! Designs I’m drawn to are geometries, florals, and stripes. 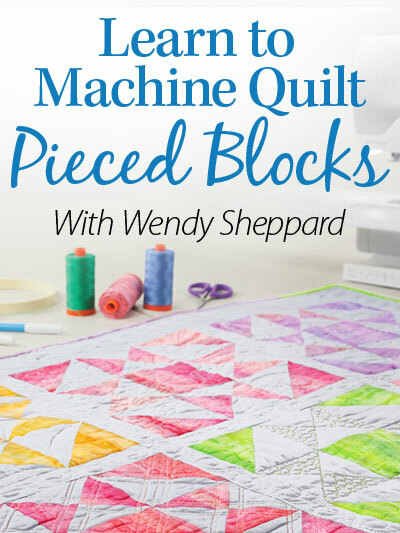 I really love the fabrics you’ve used in this quilt. All such great colors. Beautiful quilt and fabrics. I love brights! That being said, I change the colors often. Lately I’ve been drawn to deep blues, purples, and greens with geometrics. I love the quilting you did on this sweet quilt. I like working with red , white and blue for the American Hero quilts. The mixture of solids, blenders and prints. My 2nd favorite is novelty prints for kids. Beautiful quilt, as always, Wendy! Since I mostly make charity quilts for young children, I’m drawn to lines with bright colors and simple prints. I personally love florals, but find them limiting when trying to create gender-neutral designs. Geometrics are particularly welcome! I love floral fabrics, so these would be right up my alley….love the colors and the prints! I love small florals, and if the line has a coordinate stripe or solid/tone on tone, then I will buy several different from the same line. 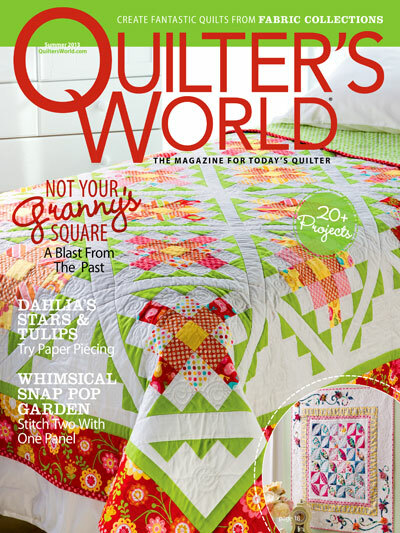 Your quilting is beautiful as always, and I am headed to watch the video now. Getting ready for the “big snow” here as well! By the way, I used to say to everyone that I would get to their priorities during my spare hour, which I said was midnight to 1 am… Now, that said, I worked in my studio until 1230 am last night, and I am exhausted and ready for a name at 5:45 pm; with supper and household tasks that await me. I hope you do take time to enjoy your lovely family! I like florals in the latest bright colors. Your designs are wonderful. I love floral prints and FABRICS!!! Your designs are great! Floral prints are my favourite. Love the quilt! I love all fabrics, I have a little and a lot of everything from novelties to floral and vintage. That looks great, Wendy. I like how you did those feathers in that design. I would say that I prefer florals or geometrics in fabric designs. I seem to be drawn to the jewel tones. Pretty fabric. My favorite fabric theme is 30s repros. There is just something about them that makes me smile. Thanks for the chance to win! My heart belongs to florals. My favorite are florals. Thanks for a chance to win. I have to say florals are my favourite. Stay safe…& cozy..as the storm heads your way Sending prayers to all in the way too…my daughter lives near Raleigh, NC,,,they are bracing for it there too. The fabrics that I use the most are blenders such as tone on tone, though I love great florals and Christmas fabrics. I love florals. Your quilt is lovely. Thank you for sharing. Your quilt is just lovely. Makes me want to sing DeLovely. I really don’t have a favorite theme. Just about anything works for me depending on my frame of mind. Last week I needed geometrics. I like fabrica with bright colours and there is always a pink fabric in it. Wow – I love your quilt! I love florals and childrens fabrics. I tend to make a lot of baby quilts. Very pretty, I just love stars. I adore florals, especially a fabric line with a large one that also has coordinating smaller florals. I also like small prints like shirtings that will blend with the florals—especially those that have a vintage look. Your feathers are beautiful….the long feathers are very graceful looking. I very much like the way you started in the center and radiated the quilting out in diamonds. I would NEVER have thought to quilt flying geese like that—up until now anyway. Thank you for opening my eyes to see the possibilities of feather placement. Truth be told, I would quilt feathers on every quilt. Blessings….stay warm and safe….Have fun in the snow with Miss Baby. I am a big fan of batiks and anything in purples/pinks. 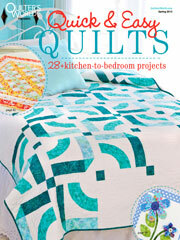 Love your quilts. Your quilt is beautiful! My favorite lines are usually floral. Thanks for the opportunity to win! Hi, I love the colours in this collection. I am currently planning a baby quilt for my great niece to come. I like prints that let the quilt flow from babyhood to childhood. So I guess children prints are in my mind at the moment. I love this fabric line and I love the quilt you made with it. I gravitate toward small floral prints – especially ones with blue in them. Thanks! First–I really like your quilt! The fabrics “sing” with the understated pattern, and your quilting is the shining sun that gives life to the birds. With the addition of the black prints, the fabrics look entirely different. Seasons – each one has its own color range. My favorite theme at this point are prints with lots of visual texture. For images, I am crazy about birds right now. So exciting to find your post today — I just ordered the kit yesterday– I am drawn to batiks, right now I’m going thru a modern and solids phase– I love everything! I honestly have no definitive favorite! All depends on who it’s for and whatever strikes my fancy at any given moment… Explains why my hubby is always dragging me away from fabric stores kicking and screaming like a child! lol! I seem to look at blenders the most. But I also love small print fabrics and Civil War fabrics. Thanks for the fun and for giving out a gift. Would love to play with these beautiful prints. I love vintage fabric. I have some Browns and pink civil war looking fabric that’s gorgeous. Some of it is floral. I’m trying to find a good pattern to use it. I really like novelty prints, especially ones with food on them! i love novelty prints especially butterflies and sewing related. Lately I have been drawn to geometric prints. I like a lot of different fabrics but am drawn to reproduction prints, both 30’s & Civil War. Many of the fabrics I’m drawn to are modern designs such as angular shapes and lines. I also love polka dots! I am always drawn to polka dots. I try to match the kid to the fabrics and colors they would like. Gingham and dots are good to use. Pastels and pretty bright colors also. Great quilt! I like fabric with words that are like handwriting right now. I love florals, especially in Christmas cok=lours. 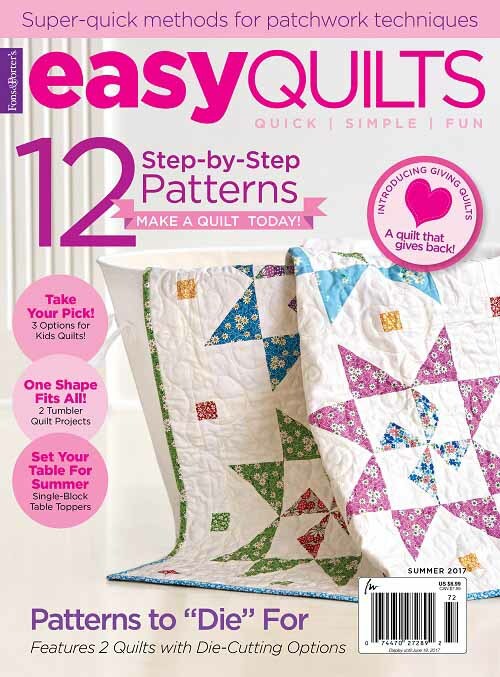 As I am new into quilting…and quilting everything in sight!…but I think the vintage florals really make my heart sing like Laundry’s Hearts Content and Red Rooster Great Gatsby! Love kids, florals and geometrical figures. Thanks for the chance to win! Love the bright happy colors – florals are always fun. BTW love the pics. Thanks for sharing and thanks for the opportunity. POSSIBILITIES ~~ This is my favorite quilt fabric catagory. Oh, the possibilities. Which means studying as much of the fabric line as possible; choosing compatable pieces (that I really like) and walking around the shop looking for a few of my new quilt’s Fabric-Friends. Really, who wants to separated from our fabric-friends? This is a time to stick together!! Let the fun begin!! !